One of 2016's Most Anticipated Coins, Made More Striking With Ruthenium and Gold! 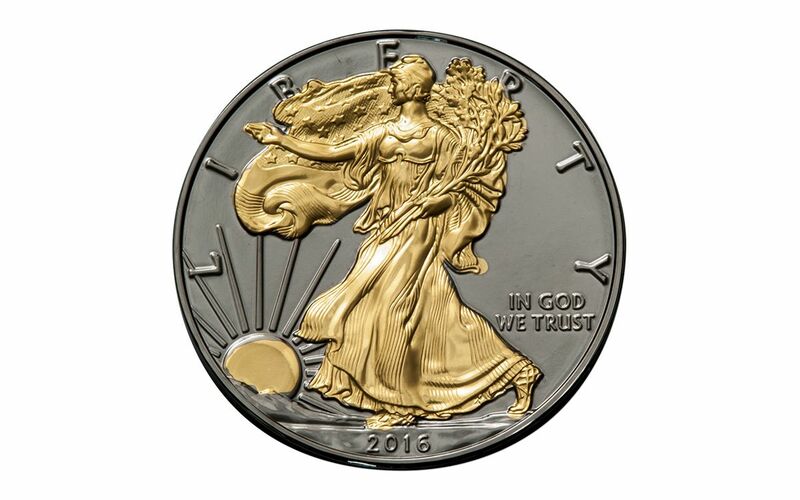 One of the biggest numismatic events of 2016 was the United States Mint's release of a special 30th Anniversary edition of the Silver Eagle Proof. Featuring incused lettering on a smooth edge for the first (and, most likely, only) time ever on a Silver Eagle, collectors had to wait until the final months of the year to finally get their hands on these fantastic proofs. Fortunately, the U.S. Mint didn't stop there! 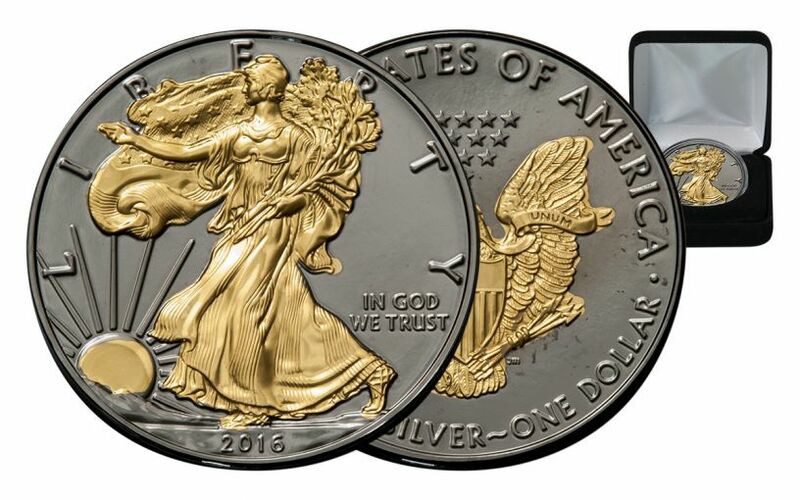 For only the ninth time since 2006, the mint produced a limited amount of Uncirculated/Burnished Silver Eagles -- this time with the same unique edge as the proof. Not only that, but these West Point-minted Burnished Silver Eagles also showcased the "W" mintmark (unlike bullion Silver Eagles). For a while, that's where the story ended . . . until recently! 99.9% Pure Silver + Rare Ruthenium + 24k Gold = an Irresistible Combination! One of the hottest trends in high-end jewelry is ruthenium, a rare transition metal that is a member of the platinum family. This scarce metal had been used primarily for industrial electronics for years. However, it's smooth, jet-black appearance and luster couldn't stay hidden forever. When our buyers found that ruthenium worked incredibly well when clad to the 99.9% pure silver of the 2016 Burnished Silver Eagle, we knew we hit upon a fusion for the ages! And when we also found out that both Adolph A. Weinman's gorgeous Lady Liberty and John Mercanti's heraldic eagle were further enhanced with 24 karat gold, we had to get as many of these coins as we could! 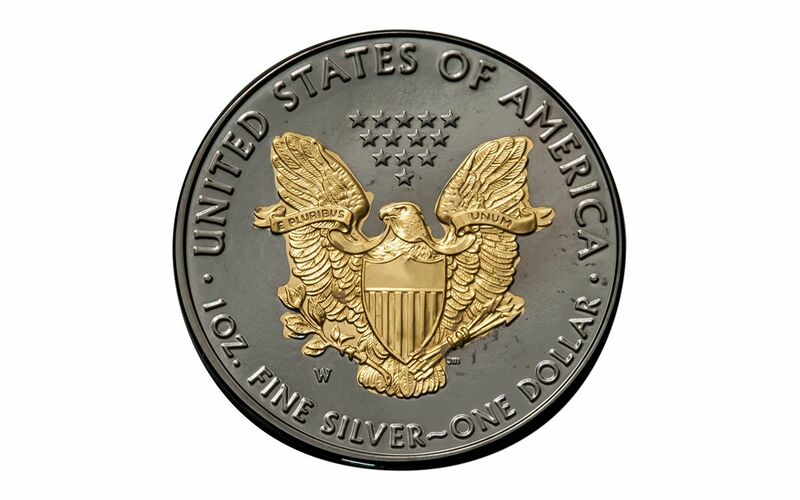 More Limited Than the Original, A Must For Silver Eagle Collectors! When these ruthenium and gold clad Silver Eagles finally arrived to our vaults, we were amazed at the care and craft that went into creating these masterpieces -- especially the fact that the layer of ruthenium still preserved the coin's unique edge lettering. Now, you can make one of these your very own! 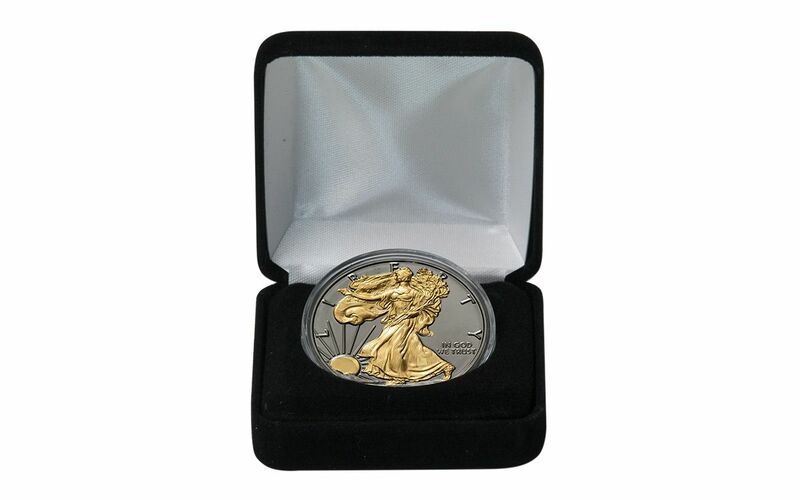 Your Ruthenium and Gold Clad 2016 Burnished Silver Eagle will arrive to you in a black felt display box along with a certificate of authenticity. Ruthenium-enhanced coins like these have been lighting up the collecting world, and we're expecting the demand for these to be incredibly strong. Whether you make it a great gift or a perfect collection addition, don't wait another moment to bring one home -- order yours now!